China's housing boom: What could they be building instead? What Would China Build If It Builds Less Housing? 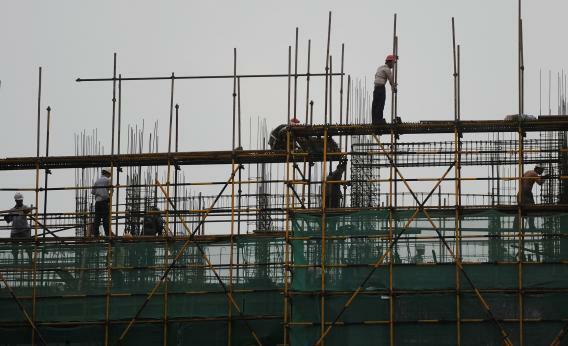 A construction team works on scaffolding at a building site in Hefei, China, on Aug. 19. Instead of just focusing on “building,” I want them to invest in human capital, so productivity can be at a level that we don’t need “make work” jobs. I want them to build more schools and hire better teachers, so classes aren’t as large and you’re not damned if you can’t make it in a top elementary school. I want productivity to be high enough that high end stores don’t need more clerks than actual customers. The focus on improving living standards in rural China is right on. But then again, if the labor productivity of Chinese agriculture improves, that’s going to displace a lot of people who are currently farmers. You would need new urban houses for them to live in and new offices or shopping centers for them to work in. Farming is an interesting occupation in that you practice it outdoors, but most everything else happens inside a building (real estate investment) or else involves piloting transportation equipment (transportation infrastructure investment). Similarly, if people are going to own more household appliances, they’re going to need bigger houses to put the stuff in. Haier, a Chinese company, is now the world’s largest make of white goods, but any boom in household appliance consumption is necessarily linked to a boom in housing consumption. The school stuff is a better point. Human capital is probably the most important thing over the long run. But a little sympathy here. When a country starts out with a low level of education, it faces the problem that you need to improve the education system in order to have enough teachers on hand to improve the education system. If China were to try to sharply reduce class size very very quickly, they’d have to be staffing the new classrooms with very unqualified people. The best you can realistically hope for is incremental change. Which is a very good reason to think that a slowdown in the rate of Chinese catch-up is inevitable—you simply can’t add to human capital as quickly as you can add to physical capital—but it’s far from persuading me that there’s an available alternative to the current building boom.